In recent years, China’s large-scale feed machinery manufacturers have introduced large-diameter vacuum quenching furnaces and began to use the vacuum furnace to quench the ring mold. This heat treatment method is called vacuum gas quenching process. Compared with the traditional integral quenching, the vacuum heat treatment technology has the following advantages: the deformation of the workpiece is small; the surface of the metal after the heat treatment is very smooth, and there is no occurrence of oxidation, corrosion, decarburization or carbonization. In particular, the roughness of the annular die hole is not substantially reduced after vacuum gas quenching, which is essential for ensuring the yield of the pellet feed. In addition, the vacuum human treatment furnace is widely used, energy-saving, safe, reliable, and non-polluting, and is easy to realize automatic operation.the gas used as the gas quenching cooling medium is nitrogen. After the pellet die is formed, the ring die is cleaned by a ring mold before the heat treatment. The ring die is cleaned in the washing machine for 3~4 hours to eliminate oil stains, rust, and iron filings in the die hole. After being taken out, it is put into a ring die dryer for drying, and the drying temperature is 180℃ for 3 hours. After the pellet die is completely dried, it is processed into the furnace. The ring dies are placed flat in the center of the hearth and stacked vertically. The pellet die is separated from the environment by spacers. When the pellet mold is placed in the vacuum chamber, it is separated from each other by two elongated metal rods. First, the heating mode of the workpiece in the vacuum chamber is mainly radiation heat exchange, so try not to block each other, and the ring molds should not be stacked directly together. Rather, the contact between the environments is controlled by technical contact, which reduces the deformation during heat treatment. At the same time, the hardness uniformity after heat treatment can be ensured. Under a certain degree of vacuum, the pellet die placed in the closed vacuum furnace is heated to the austenitizing temperature, and after the heat preservation, the Cr compound is dissolved in the structure. The length of time to maintain the average temperature can be calculated as: T = α h.
Where h is the effective thickness of the workpiece. For most pellet modes, the value should be in the range of 40~100m. a is the thermal insulation coefficient. For the heating temperature of about 1040℃, the value is 0.5 min / mm (ring mold wall thickness), and the holding time is set to 45 ~ 50 min. During the heating cycle, the pellet die experienced a preheating temperature equalization phase of 45 minutes at 650℃ and 850℃, respectively. There are two reasons. First, the thermal conductivity of high-chromium stainless steel is lower than that of ordinary carbon steel. Therefore, the temperature difference between the outer surface of the ring mold and the inner center is relatively large. In order to eliminate the thermal stress generated, it is necessary to keep the heat for a period of time. The second difference in temperature difference is due to the fact that during the heating process, the actual temperature of the ring mold is lower than the temperature in the vacuum chamber, and the larger the ring mold size, the more serious the temperature hysteresis phenomenon. Therefore, it is necessary to keep the temperature for a period of time so that the actual temperature inside the ring mold rises, which is closer to the vacuum chamber temperature in the heating cycle shown in Figs. 2-5. When the vacuum chamber was heated to a maximum temperature of 1040℃, the average temperature of 50 min was maintained. After the gas quenching cycle is started, high-speed high-pressure nitrogen gas is injected into the vacuum chamber to rapidly cool the annular mold at a temperature higher than the critical cooling rate, and the temperature is lowered to about 40℃ to obtain a martensite structure. The ring mold was held at a temperature of 60 minutes. The day is to reduce the temperature difference around the ring mold, reduce the thermal stress, and form a certain amount of lower bainite, thereby effectively preventing deformation and splitting of the ring mold. This quenching cooling method is called austempering, which is a common quenching method for high hardness and wear resistant workpieces. 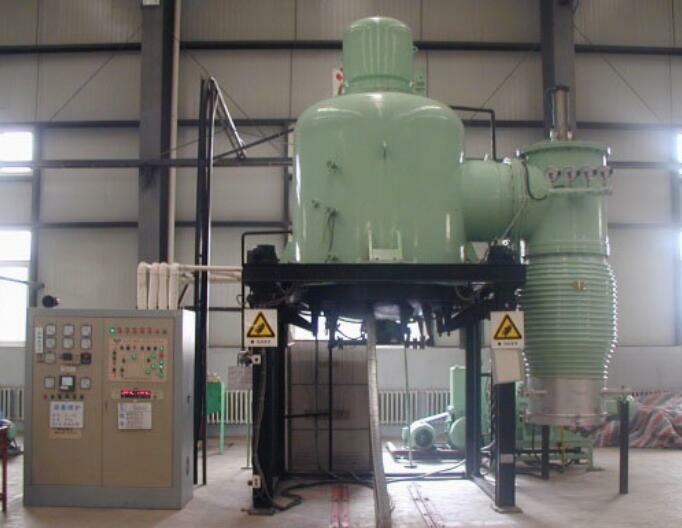 The main disadvantage of the vacuum gas quenching process is the long heat treatment time. According to the above method, it takes about 6 hours for each furnace-loaded ring mold to complete vacuum gas quenching, which is much longer than the overall heat treatment using a salt bath furnace. In order to improve the processing efficiency, the tempering zone is treated separately from the quenching zone and tempered using a special tempering furnace. The ring mold is taken out of the quenching furnace and placed in a tempering furnace for tempering, so that the workpiece can obtain good performance and make full use of the potential of the material.